Quiet: The Power of Introverts in a World That Can't Stop Talking by Susan Cain is a 2012 Crown publication. I’ve seen Susan Cain’s ‘Ted Talks’, video and knew I would have to read her book, it was just a matter of fitting it into my schedule. 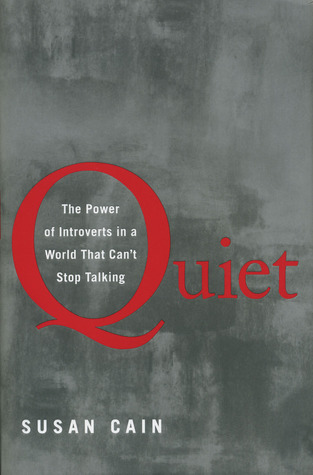 As an extreme introvert, this book definitely feels like a form of validation. See? There is nothing wrong with me. There are other people out there just like me, who avoid social situations at all cost, would rather take a good beating than speak publicly, who feel drained after social occasions, and who must have alone time. There are people who, like myself, tried to fake an extrovert personality, but were miserable because it. In a world that is increasingly group oriented, that recognizes the loud, outspoken, forceful personality over the quiet, soft spoken, unassuming temperament, this book is a Godsend. But, while the book explains the tendencies of the introvert and offers some theories on how people develop this type of temperament, and how to cope and compromise in order to fulfill your job duties and family obligations without suffering an overabundance of anxiety or develop depression or a dependence on medication, this book is also a must read for extroverts! Yes, that’s right… extroverts should read this book too, so they can understand that colleague, sibling, or spouse, or child who is quiet, craves alone time, avoids social situations, and would rather not waste time on small talk. How can employers create a workplace setting that brings out the best of both temperaments? Many people work better and are far more productive when working alone, and have much to contribute, but are often drowned out by the constant cacophony surrounding them. While I agree with nearly everything the author writes, most of the scientific studies and analogies were only moderately interesting and highly debatable. I don’t know if I agreed with all those findings, and this particular section of the books was just a little bit dull. Not everything mentioned here will pertain to every single person who identifies as an introvert. Taking the informal quiz, I answered nearly every question with ‘Yes’, but there were several traits that I do not own, so this is not a ‘one size fits all’ course, and doesn’t try to be, but I think the author covered a tremendous amount of relevant material any introvert can use and relate to. I would not consider this book a ‘self-help’ book, but the author included a few tips and exercises one can use to ease social anxiety and learn to work in groups and speak publicly. There is also a section for parents who may worry about an introverted child, and how to encourage that child, not change them. Overall, I am so happy to see the problems introverts face in an extroverted world, addressed and brought to the forefront. Hi, I'm Susan Cain, the co-founder of Quiet Revolution (www.quietrev.com) and the author of the bestsellers Quiet Power: The Secret Strengths of Introverts (Dial Books, May 2016), and Quiet: The Power of Introverts in A World That Can’t Stop Talking (Crown Publishers, Jan. 2012). I'm also the co-founder of the Quiet Schools Network and the Quiet Leadership Institute.